After attending a press conference for the Rams at the Forum, Molly Higgins, the franchise’s vice president of Corporate Commun­ications and Civic Affairs, took notice of a group of children who were playing across the street. The children where students of Kelso Elementary; their schoolyard faces the Forum and the site for the new stadium. Higgins then wanted to give the students an opportunity to meet their new neighbors. “I thought it was important to host our first big community outreach event in Inglewood - a community that has been so good to us and will soon be the new home of the Rams.” Higgins stated. 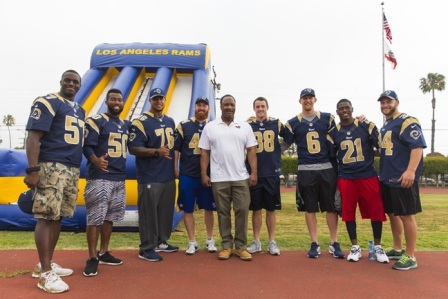 On Friday, the Los Angeles Rams hosted a PLAY 60 field day for 14 Inglewood schools. Ele­mentary and middle school children congregated on Coleman Field to engage in activities with Rams players. The PLAY 60 is an initiative created by the NFL, encouraging 60 minutes of physical activity a day in order to diminish childhood obesity and promote a healthy lifestyle. Children had the opportunity to run the 40-yard dash, run through inflatable obstacle courses, and take photos with the Rams Cheerleaders and Rampage, the Rams mascot. Defensive backs Cody Davis and Coty Sensabaugh, and linebacker Cameron Lynch were some of the Rams players that engaged with the students. In 2009, the franchise began the Staff Day of Service Program, a monthly outreach event where the Rams front office goes out to volunteer at local nonprofits. The field day was the inaugural Staff Day of Service in the Los Angeles Area. The Rams participated in playground builds and neighborhood cleanups. They also volunteered at the Salvation Army and the American Cancer Society, racking up over 12,000 community service hours.